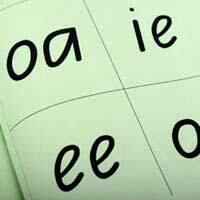 Children learn how to read and spell by using synthetic phonics. This popular method of teaching children phonics is to teach them how to sound out the letters. When they have acquired this skill, the children should be able to successfully blend the words together. This is actually known as phonemes (the sounds) and Synthesising (blending the words together). Traditional Alphabet Or Phonetic Alphabet? So, technically, your child doesn’t have to learn the alphabet in its original form, but instead learn the phonetic alphabet. The phonetic alphabet is comprised of 44 phonemes, this includes the sounds of letters blended together, such as: sh, ch and ee. To simplify the meaning, your child will not learn the letters of the alphabet, but instead learn the sounds the letters make. When you are helping your child at home with their phonics, you should make sure you use the phonetic alphabet rather than say “A, B and C”. But instead use the sounds they make /a/, /b/ and /c/. If you can’t remember the phonetic alphabet, (it may be some time since you used it! ), there are lots of online resources that can refresh your memory. Your child’s teacher may be able to give you a tape or a learning resource to help you remember. Flash Cards – Flash cards are excellent for helping your child see the letter and make the sound. You may have to say the sound first then ask your child to copy you. Forget what you have learnt – Children love nothing more than being the teacher for a while. So, next time you are writing your shopping list, ask your child to help you. For example: tell your child you need to buy apples, but you can’t remember how to write it down. Explain to your child that you need to know what letter the word apple starts with and how it sounds. You can use flash cards to help here too. How Quickly Will My Child Learn Phonics? How quickly your child learns depends on lots of different factors. For example: how much time do you have to help your child? Is your child quick to pick up new information? However, when using synthetic phonics, children generally learn quickly. They begin by learning how to sound out a word such as “cat”. The phonetic spelling of “cat” is actually “kat”. But, as the point of synthetic phonics is to learn how words blend together and not how they look, this is a good starting point. After your child is proficient in the phonetic alphabet, they can then go on to learn the actual alphabet in its more traditional sense. As they can sound out many words using the phonetic alphabet, your child will be able to read and speak much more fluently as they sound out the words. Before you begin teaching synthetic phonics at home, make sure your child’s school is using the same teaching programme. While using phonics in this way has proven to be beneficial to the child, if they are being taught differently at school, it will only cause confusion. Now, most schools do use synthetic phonics to teach all children of different abilities. Even children with learning disabilities learn well with this method. Check with your child’s teacher before you start, and when given the go ahead, you can help your child really understand the English language.